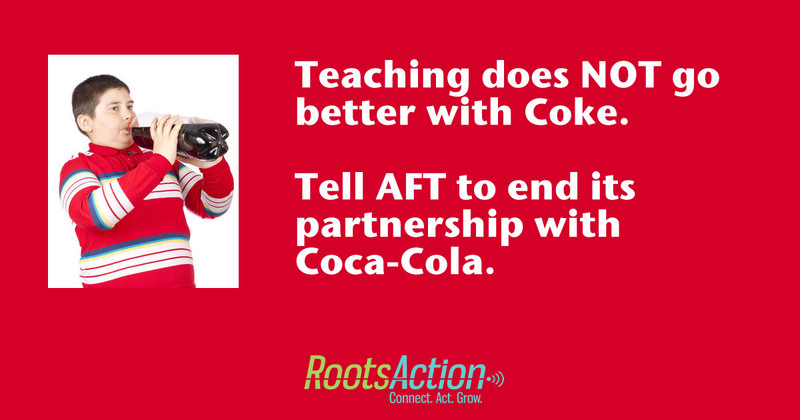 As strong supporters of teachers and teachers' unions, we are distressed that the American Federation of Teachers (AFT) is partnering with Coca-Cola. Four months ago, AFT members caused their union to begin a boycott of Coca-Cola over its reliance on child labor. But now the union leadership has caved. With terms of the agreement undisclosed, AFT ended the boycott -- and has begun a partnership to do things like "advocating for increased educational opportunities for children." "The most effective way for Coca-Cola to help end illegal child labor in places like the Philippines and El Salvador," said Ray Rogers, director of Corporate Campaign Inc., "is not through pointless additional studies, audits and meaningless rhetoric, but to pay sugar processors enough money to pay fair wages to sugar cane harvesters." Stop undermining teachers' moral authority and children's health. End your partnership with Coca-Cola.